2017 Weingut Von Winning, Riesling Trocken, Estate, Pfalz, Germany. 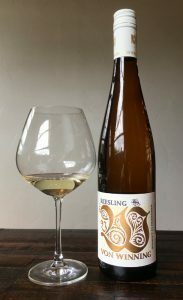 It’s terribly hard not to love these 2017 vintage Rieslings from Germany, and especially these Von Winnings that hail from the Pfalz region, these are wines that show terroir, beautiful aromatics and a Burgundy like elegance and textural quality. This 2017 Estate Trocken is bright with cool mineral intensity and stony in character, but with a feeling of extract and density that is quite riveting for a wine in this price class with layers of tangerine, green apple, lime zest, chamomile, lemongrass, crystallized ginger and chalky and saline infused wet stones. This vintage builds as it opens, expanding to give a real impact on the palate, while staying laser like sharp in detail and acid driven, it’s wonderfully expressive and impressive and stunning with cuisine. Von Winning is committed to organic farming and train their vines much the same way as they do in the Cote D’Or, preferring native yeasts and lees aging in oak casks along with stainless in the basic wines, again there is a nod to Burgundy with their inspiration. If you are looking to explore the Pfalz, there are two wineries that you must not miss, Mueller-Catoir and Von Winning and both have produced exceptional 2017’s that look likely to become legends. Fast becoming one of Germany’s finest estates, Weingut Von Winning has an amazing lineup of wines and are known for their incredible GG’s, which are lush Burgundy style and quality dry Rieslings as well as making some of the world’s absolute best Sauvignon Blancs! Beyond the top wines here there is a lot of value too, in particular, this estate Trocken Riesling which delivers intensely dry crisp detail and complexity for an insanely low price. Famous importer and Riesling guru, Terry Theise says Pfalz Rieslings are spice-bombs of ginger and pineapple, yet none of that is incompatible with great class and refinement in the top wines, whether dry or not-dry, of which I agree completely, and as much as I wish I could be drinking Von Winning’s Grosses Gewachs, like Kirchenstück, Ungeheuer and Pechstein to name a few, I can more afford their Paradiesgarten Erste Lage and or this basic Trocken, especially this 2017 version which is a class act with a bone dry focus, but with, as mentioned, surprising depth and length gaining hints of rosewater, earthy gooseberry, tropical essences and apricot in the glass, this is a fantastic year for German wines and this one has potential to age 10 to 15 years, though it is already pretty easy to love!